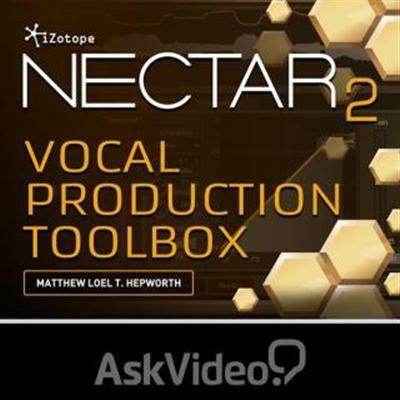 Ask Video iZotope Nectar 2 Vocal Production Toolbox TUTORiAL-DYNAMiCS | Free eBooks Download - EBOOKEE! Ask Video iZotope Nectar 2 Vocal Production Toolbox TUTORiAL | 316 MB Produce stunning sounding vocals, VOs and special FX with iZotope? s powerful Nectar 2 plugin. This 44-tutorial course ? designed by Matt Hepworth ? is filled with tons of tips and tricks that? ll take your vocal tracks to the next level! When you combine iZotope? s Nectar 2 with Matt Hepworth? s immense audio knowledge, what comes out the other side is some really enlightening training tutorials! Matt takes you through every aspect of this amazing voice/vocal plugin explaining, all along the way, how to operate and deploy Nectar's vast set of audio features. This course ? with its plentiful audio examples ? dissects all of Nectar's different modules one-by-one, offering the kind of in-depth exploration that you just can? t get anywhere else. You? ll learn about the Nectar 2 GUI, Pitch, Gate, Harmony, Saturation, EQ, Compressors, De-Esser, Limiter, FX, Delay, Reverb, Breath Control, and Pitch Editor. If you? re producing VOs, podcasts, vocal tracks or even T-Pain kinds of special FX, this course teaches you everything you need to know! So dive into Nectar 2: Vocal Production Toolbox and get your voice/vocal tracks sounding the best that they can be! No comments for "Ask Video iZotope Nectar 2 Vocal Production Toolbox TUTORiAL-DYNAMiCS".